Congreso de Humanidades Digitales Hispánicas HDH2017. Málaga, 18-20th October 2017. Curso de verano. España y los orígenes de la globalización, 1500-1800. Universidad Internacional Menéndez Pelayo (Santander). 7-9 Agosto 2017. Posibilidad de becas. Summer course: "Cádiz y la Bahía en el contexto internacional del siglo XVIII". Universidad de Cádiz. 3-5 July 2017. 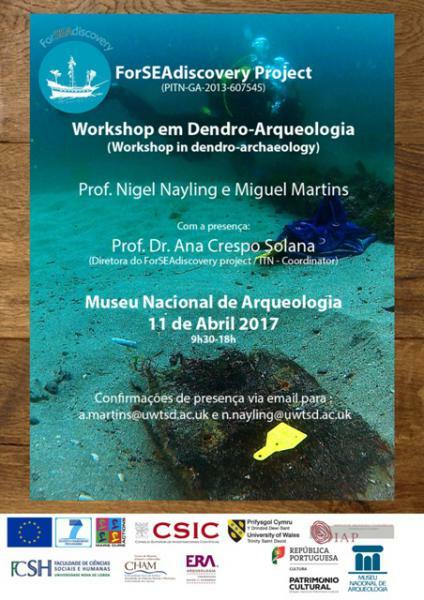 Workshop in Dendro-archaeology. Lisbon. Museu Nacional de Arqueologia. 11st April 2017. The Adventure of the Armadas: An Historical and Archaeological Perspective. CCHS-CSIC. Madrid (Spain). 28th February 2017. Árvores, Barcos e Homens na Penísula Ibérica (Séculos XVI-XVIII), Lisboa (Portugal). 26-27th January 2017. 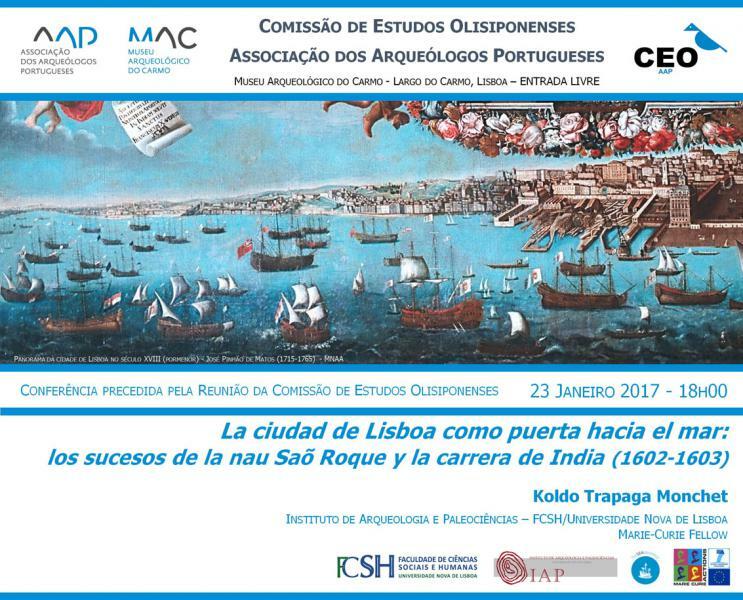 La ciudad de Lisboa como puerta hacia el mar: los sucesos de la nau Saõ Roque y la carrera de India (1602-1603). Koldo Trápaga Monchet. Lisbon (Portugal). 23rd January 2017. ‘Y al fin fue al Agua': Formas de provisión de madera y construcción naval para las Armadas Reales en Lisboa (1589-1621). Koldo Trápaga Monchet. Lisboa (Portugal). 10th November 2016. Os navios ibéricos na expansão europeia: Tipologias e Tonelagens. Filipe Castro.Universidade Nova de Lisboa (Lisboa, Portugal). 31th October 2016. ​IKUWA 6. The Sixth International Congress on Underwater Archaelogy. Western Australia Museum. 28 November- 2 December, 2016. More Info. Heritage & Environment Research Cluster Seminar Series. ​Building Boats and Bridges. University of Wales Trinity Saint David. Arts Building, Lampeter Campus. 20th April-18th May 2016. Forest Resources for Iberian Empires: Ecology and Globalization in the Age of Discovery. University of Wales Trinity Saint David, Lampeter. 27th May 2016. 6th Sound Toll Registers Online conference 2015. Antwerp, Belgium 22-23 October 2015. More Info. 14th International Symposium on Boat and Ship Archaeology (ISBSA 14) Gdańsk, Poland, 21-25 September 2015. More Info. 1st Network Meeting & Intensive Training Workshop (Madrid, Spain, 12-17 January 2014). 10 December, 2014. Salón de Actos del Museo de Pontevedra 12:00 h.
Congress Ikuwa V. October 15-19, 2014. Museo Nacional de Arqueología Subacuática. ARQVA, (Cartagena, España). ​September 8-12, 2014. Lugo, Spain. European conference on dendrochronology. September 7, 2014. Lugo, Spain. Day dedicated to present the research carried out at the University of Santiago de Compostela to the citizens of Lugo. A stand with posters, microscopes and different wooden objects will be located besides the town hall building.